Handheld NAUTIZ X8 Android 4.2.2 or Windows Ultra-Rugged Mobile Computer - Nautiz X8 A front-runner in the new generation of handheld computers, the ergonomic Nautiz X8 delivers the largest, most brilliant capacitive touchscreen in its class, along with an unprecedented combination of processing power, connectivity and field ruggedness OS: Windows WEH 6.5.3 or Android 4.2.2 CPU: Texas Instruments OMAP 4470 DualCore at 1.5GHz, 1Gb Ram and 4Gb iNand Flash Disk 5200mAhLi-Ion battery, lasts up to 12 hours. U-Blox GPS, built-in 8-megapixel camera with autofocus and an LED flash, Included: Power adapter, Capacitive stylus, Battery, Hand strap, USB-cable and Quick-start guide. (Please note, Earphones not included) - It’s IP67-rated and meets stringent MIL-STD-810G U.S. military standards, with operating systems — Android 4.2.2 or Windows Embedded Handheld 6.5.3. 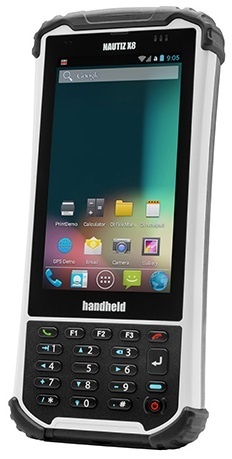 Handheld NAUTIZ X8 Ultra-Rugged Mobile Computer, 1.5Ghz,1Gb/4Gb, Wlan, Bt, 8MP Camera, WEH 6.5.3, GPS, compass, altimeter and G-Sensor - 4.7inch FWVGA capacitive touchscreen, Bluetooth, Texas Instruments 4470 dual-core 1.5 GHz, 1GB RAM/4 GB iNAND Flash, Windows Embedded Handheld 6.5.3, 802.11 b/g/n, Camera: 8 megapixel rear-facing camera with autofocus and LED illumination, Includes Power adapter, Capacitive stylus, Battery, Hand strap, USB-cable and Quick-start guide. Please note, Earphones not included. Handheld NAUTIZ X8 Ultra-Rugged Mobile Computer, 1.5Ghz,1Gb/4Gb, 3G Wan, Wlan, Bt, 8MP Camera, WEH 6.5.3, GPS, compass, altimeter and G-Sensor - 4.7inch FWVGA capacitive touchscreen, Bluetooth, Texas Instruments 4470 dual-core 1.5 GHz, 1GB RAM/4 GB iNAND Flash, Windows Embedded Handheld 6.5.3, 802.11 b/g/n, Camera: 8 megapixel rear-facing camera with autofocus and LED illumination, Includes Power adapter, Capacitive stylus, Battery, Hand strap, USB-cable and Quick-start guide. Please note, Earphones not included. Handheld NAUTIZ X8 Ultra-Rugged Mobile Computer, 1.5Ghz,1Gb/4Gb, CDMA Wan, Wlan, Bt, 8MP Camera, WEH 6.5.3, GPS, compass, altimeter and G-Sensor - 4.7inch FWVGA capacitive touchscreen, Bluetooth, Texas Instruments 4470 dual-core 1.5 GHz, 1GB RAM/4 GB iNAND Flash, Windows Embedded Handheld 6.5.3, 802.11 b/g/n, Camera: 8 megapixel rear-facing camera with autofocus and LED illumination, Includes Power adapter, Capacitive stylus, Battery, Hand strap, USB-cable and Quick-start guide. Please note, Earphones not included. Handheld NAUTIZ X8 Ultra-Rugged Mobile Computer, 1.5Ghz,1Gb/4Gb, Wlan, Bt, 8MP Camera, Android 4.2.2, GPS, compass, altimeter and G-Sensor - 4.7inch FWVGA capacitive touchscreen, Bluetooth, Texas Instruments 4470 dual-core 1.5 GHz, 1GB RAM/4 GB iNAND Flash, Android 4.2.2, 802.11 b/g/n, Camera: 8 megapixel rear-facing camera with autofocus and LED illumination, Includes Power adapter, Capacitive stylus, Battery, Hand strap, USB-cable and Quick-start guide. Please note, Earphones not included. Handheld NAUTIZ X8 Ultra-Rugged Mobile Computer, 1.5Ghz,1Gb/4Gb, 3G Wan, Wlan, Bt, 8MP Camera, Android 4.2.2, GPS, compass, altimeter and G-Sensor - 4.7inch FWVGA capacitive touchscreen, Bluetooth, Texas Instruments 4470 dual-core 1.5 GHz, 1GB RAM/4 GB iNAND Flash, Android 4.2.2, 802.11 b/g/n, Camera: 8 megapixel rear-facing camera with autofocus and LED illumination, Includes Power adapter, Capacitive stylus, Battery, Hand strap, USB-cable and Quick-start guide. Please note, Earphones not included. Handheld NAUTIZ X8 Ultra-Rugged Mobile Computer, 1.5Ghz,1Gb/4Gb, CDMA Wan, Wlan, Bt, 8MP Camera, Android 4.2.2, GPS, compass, altimeter and G-Sensor - 4.7inch FWVGA capacitive touchscreen, Bluetooth, Texas Instruments 4470 dual-core 1.5 GHz, 1GB RAM/4 GB iNAND Flash, Android 4.2.2, 802.11 b/g/n, Camera: 8 megapixel rear-facing camera with autofocus and LED illumination, Includes Power adapter, Capacitive stylus, Battery, Hand strap, USB-cable and Quick-start guide. Please note, Earphones not included.